This cake was made for my grandson's 1st birthday. The barn cake was made from a house pan. The silo was made by stacking 3 muffin sized cakes on top of each other. Both were stabilized on the cake board with wooden dowels. My husband drilled holes into a wooded cake board and attached the dowels. The cakes were then slid onto the dowels. The cake was frosted with red frosting. I used a flat tip and white frosting for the barn accents - the diagonal lines in the door and window were a size smaller than the border lines. The shingles on the roof are Wheat Thins crackers. I used gray frosting and a star tip to decorate the sides of the silo. The top of the silo is smoothed gray frosting. The pasture and field were made from 2 8x8 cakes, one of which was cut in half and then placed nest to each other (I kept the other half to use for decorations later). Half of that rectangle was frosted green and then decorated with a grass effect frosting tip. 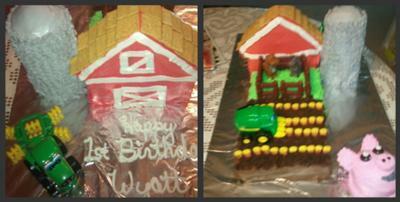 The cow, horse, and fence came in a set with the two tractors that are also on the cake. The remaining portion of the rectangle was frosted brown and then topped with crumbled cake from the remaining half of the cake that was not used. I placed candy corn into the cake with the yellow part sticking up in rows on the cake. A corn picker tractor was placed to look like it was picking the candy corn. The pig cake was my grandson's individual cake. It was made from a muffin sized cake that was frosted pink. The ears and nose are medium sized marshmallows that were shaped and attached to the cake with toothpicks. (They needed to be removed before the cake was given to my grandson, for safety). The ears were decorated with a star tip. The details on the nose were miniature chocolate chips. The eyes were Junior Mints with white dots of frosting. The mouth was made using a wide writing tip and black frosting. Return to November 2011 Cake Decorating Contest Submission Form.